Fresh from the oven at Jo’s Country Junction is the latest Moda Bake Shop recipe….Sophie’s Bouquet. 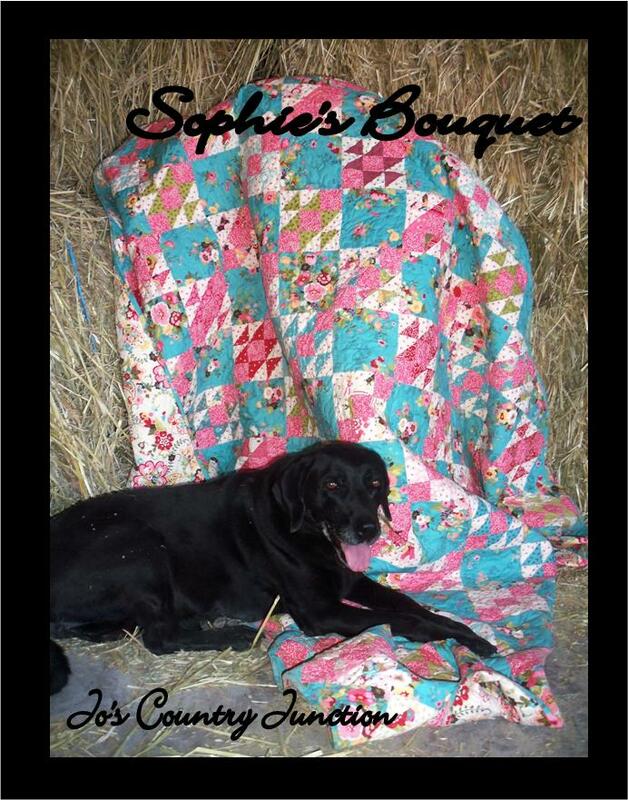 Our old farm dog, Pepper, is showing off the quilt that features fabric from the line Sophie by Chez Moi. I am in love with the fabric. 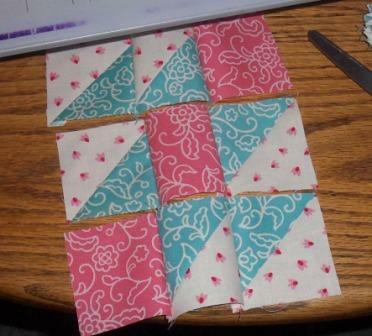 I am especially in love with the turquoise blue floral fabric that is used as the setting squares. The floral design is amazing. 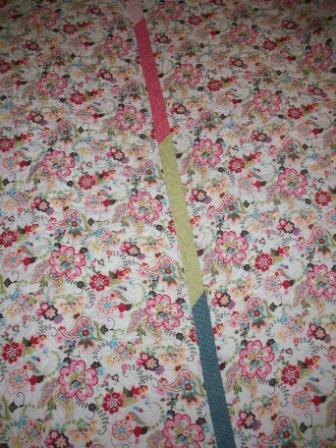 The quilt uses one jelly roll along with extra yardage. To get you started, Kimberly over at the Fat Quarter Shop is sponsoring a giveaway over on my blog to get you started on the project. After you’re done here, hop on over and check it out. You will also need a half square triangle ruler such as an Easy Angle. 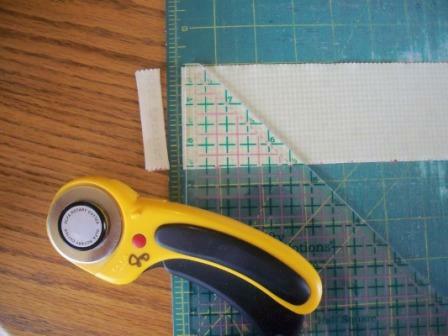 If you would want to fussy cut the setting squares, you will need extra yardage. Cut 12~ 6 1/2″ strips. Sub cut into 72~ 6 1/2″ squares. Cut 3~ 9 3/4″ strips. Sub cut into 9~ 9 3/4″ squares. Cut these squares twice on the diagonal to get your setting triangles. You will use 34. 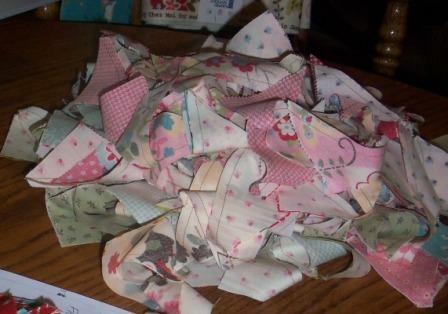 Cut 2~ 5 1/8″ squares. Cut once on the diagonal to create 4 corner triangles. Cut 17~ 2 1/2″ strips. Sub cut into 270 2 1/2″ squares. When I made my version, I used the lights from the jelly roll pieces for some of the back ground in the blocks. I cut the remainder from the light yardage. You can do it the way I did or you can make all of the background from the same fabric. You will need a total of 23~ 2 1/2″ strips for the background. I pulled out the strip of fabric that matches the setting fabric and set it aside. Take one of the jelly roll strips. Layer it right sides together with one of the light 2 1/2″ strips as shown. Place it on the cutting mat. Take the half square triangle ruler and position it over the top. Cut a straight edge on the side as shown. Following the manufacturers instructions that came with the ruler, cut triangles as shown. 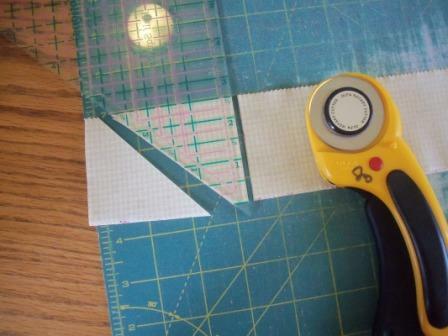 Flip the ruler as you make each cut. Each block needs six sets of triangles. Continue cutting across the strip making triangles. You will get four sets of six triangles per strip. Chain piece the triangles, keeping the like triangles together. Cut the triangles apart. Clip the dog ears and press towards the dark fabric. Continue keeping like squares together. 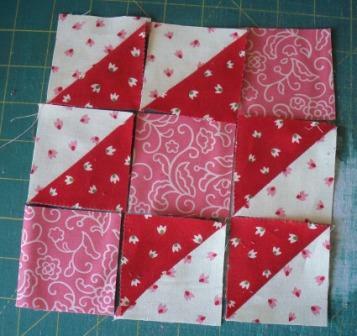 Layout the half square triangles along with three pink squares as shown. Sew the blocks into rows. Sew the rows into blocks. Continue until you have 90 blocks. Press blocks. Now is the fun part…the layout. This quilt is set on the diagonal. It’s easy to get blocks twisted or turned. I kept watching and checking to make sure those pink squares were lined up in rows. Continue laying the blocks out in a 9 x 10 setting. Sew the blocks into rows then sew the rows into a quilt top. Notice the pink squares are all in a line. Take the backing fabric and cut it in half. From the remaining jelly roll strips cut 6~ 21″ pieces. Piece them together connecting them on the diagonal as you would binding strips. Sew the strip between the two backing pieces. This isn’t completely necessary. I just like to do it so that I don’t have to try to match the prints in the backing fabric. Layer the backing, batting and quilt top together. Quilt as desired. Cut eight 2 1/2″ strips of the blue floral fabric. Use them to bind the quilt. One 74″ x 83″ quilt. 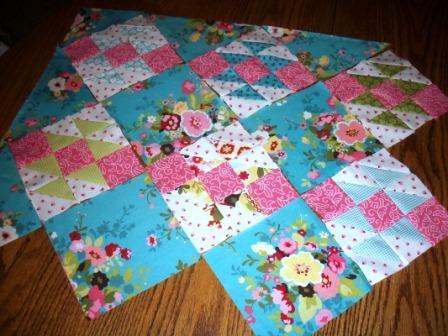 Come on over to my blog, Jo’s Country Junction, and see all the pictures I took while making the quilt. There were a few mishaps that went into this quilt. 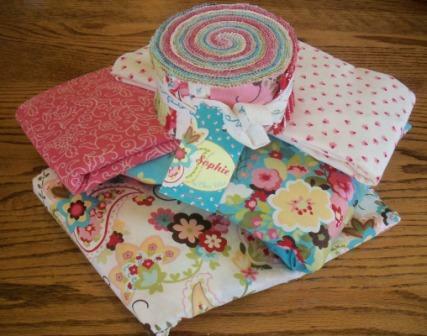 You will also want to check out the giveaway that Kimberly from The Fat Quarter Shop is sponsoring there. This entry was posted in Jelly Roll, Moderate, Quilt and tagged Chez Moi, Jo's Country Junction, Sophie.